Mon., Dec. 22, 2014, 8:26 a.m. 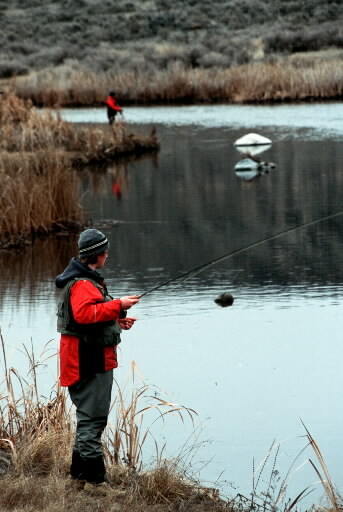 FISHING -- Anglers are getting the run around at Rocky Ford Creek, a fly-fishing holy water north of Moses Lake. The issue: Lack of money to fix the lower footbridge. Since wading is prohibited at the desert spring creek, anglers have only one way to cross the stream -- the upper bridge. During the spring of 2013, WDFW engineers inspected the lower RFC footbridge and due to public safety concerns and liability instructed Region 2 Lands Division staff to close the footbridge to public use. Bank erosion along the eastern and western shorelines has caused the footbridge approaches to fail and compromised the wooden piers the footbridge rests on. Essentially, it’s at risk of tipping or collapsing. Unfortunately, there is no quick or easy fix to the footbridge to safely re-open it for public use. WDFW will need to replace, and possible relocated, the existing footbridge. Early cost estimates to replace the footbridge range between $100,00 to $160,000 and covers permitting, materials, engineering, and labor. WDFW has requested capital funds (legislatively appropriated) and applied for grants through the Recreation and Conservation Office. To date, our funding attempts have been unsuccessful. However, WDFW will continue to look for funds to replace the footbridge. In the meantime, anglers wanting to fish from the east shoreline of RFC will need to cross at the upper footbridge and hike downstream. Perhaps the 20 clubs in the Washington Council of the Federation of Fly Fishers will look into giving this effort a boost.